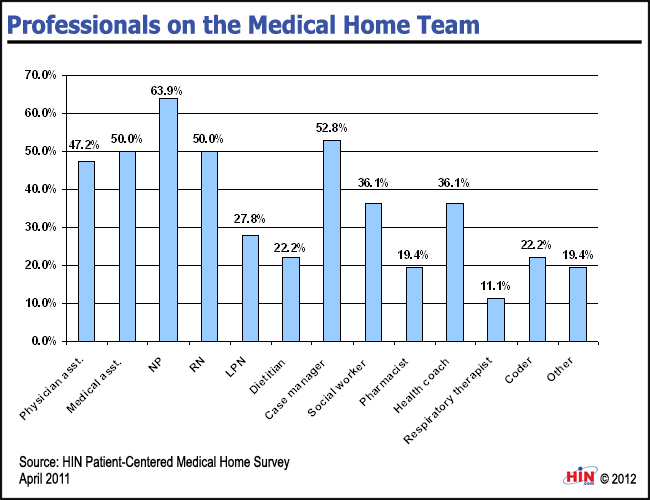 Healthcare Intelligence Network- Chart of the Week: Who Belongs on the Patient-Centered Medical Home Team? Feel free to post this chart (in its entirety) or link to this page. Healthcare Intelligence Network's Chart of the Week is yours to use in your blog, presentation or simply for reference. 2011 Medical Home Performance Benchmarks: Adoption, Utilization and Results is the Healthcare Intelligence Network's latest annual in-depth analysis of medical home awareness, adoption, tools, technologies, challenges, benefits and outcomes. This exclusive 65-page report analyzes the responses of 115 healthcare organizations to HIN's fifth annual industry survey on the PCMH, administered in April 2011. It delivers the latest metrics and measures on current and planned PCMH initiatives, providing actionable data on PCMH effectiveness, targeted populations and conditions, medical home team members, and much more. 2011 Medical Home Performance Benchmarks: Adoption, Utilization and Results is available from the Healthcare Intelligence Network for $209 by visiting our Online Bookstore or by calling toll-free (888) 446-3530.